YACHTING: Emirates Team New Zealand capsized spectacularly to cap a chaotic day of America’s Cup racing on the wind-whipped waters of Bermuda’s Great Sound yesterday (June 6). All crew members were reported safe as the race against Ben Ainslie’s Land Rover BAR was black-flagged and support crews rushed to the aid of the crippled Kiwi catamaran. 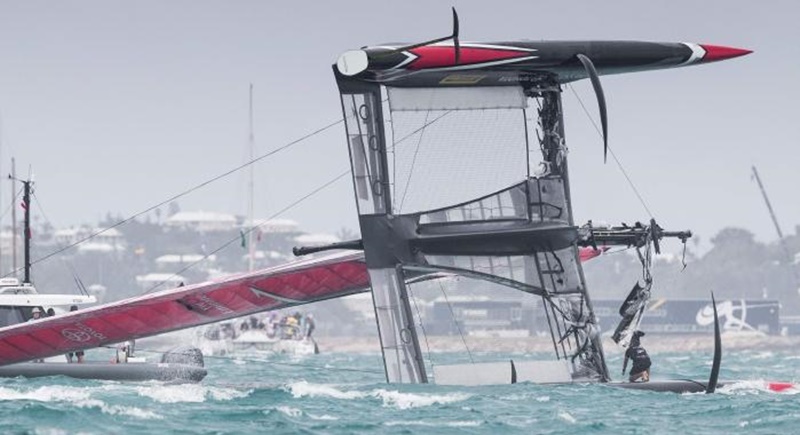 The New Zealand boat rose on its hydrofoils rapidly just before the start and lost control, its bows plunging into the water before the boat flipped sideways, its massive fixed wing sail in the water. Three of the crew remained in their cockpits in one hull suspended high above the water, while the other three went overboard. “I was very thankful when I was sitting up top to be able to look out back and see all their heads above water,” said New Zealand helmsman Peter Berling, one of those left on board. Burling said the team were still assessing the damage – and the precise cause of the mishap. Ainslie, who had crossed the start line in front, immediately slowed and instructed the support boat following him to return to render assistance. High winds and intermittent lashing rain made for what four-time Olympic gold medallist Ainslie called “an incredible day of racing”. “I don’t think in 30 years of sailing I’ve ever experienced anything quite like that,” Ainslie said of racing the temperatmental AC catamarans in winds averaging upwards of 21 knots (38.89 Km/h) with gusts even higher. The New Zealand capsize handed the British outfit their first point of the first-to-five semi-final series, which New Zealand led 3-1 at the end of the day. SoftBank Team Japan beat Artemis Racing of Sweden twice to take a 3-1 lead in their series. But all four teams were challenged by the conditions, with gusting winds causing at least some degree of damage to every boat. New Zealand, trying to book a return to the America’s Cup Match after a heartbreaking loss to Oracle Team USA in San Francisco four years ago, had looked solid in building a 2-0 lead over the Brits with two wins on Monday (June 5). But disaster struck even before racing began yesterday when they found themselves in a frantic bid to replace their damaged fixed wing sail in time to make the start of their first race. Burling said the damage was to the bottom flap, but declined to go into specifics lest he give away design secrets. They sailed with composure, overtaking BAR mid-race and hanging on to take their series lead to 3-0. Japan took a 2-1 lead over Sweden when the struggling Artemis retired from their first race of the day. “She’s still upright, so that’s a good start,” SoftBank helmsman Dean Barker said after both boats took a beating. Controversy erupted in the second race between the two, with Artemis tactician Iain Percy infuriated by penalties meted out after they sailed full-tilt beyond the course boundary. However, that drama paled in comparison to the frightening capsize in the final race. High winds are again forecast for today, and if they top the 24 knot (44.45 Km/h) limit allowed for racing New Zealand could get an extra day to make repairs.